(Nanowerk News) A silicon quantum dot (QD)-based hybrid inorganic/organic light-emitting diode (LED) that exhibits white-blue electroluminescence has been fabricated by Professor Ken-ichi SAITOW (Natural Science Center for Basic Research and Development, Hiroshima University), Graduate student Yunzi XIN (Graduate School of Science, Hiroshima University), and their collaborators (Applied Physics Letters, "White-blue electroluminescence from a Si quantum dot hybrid light-emitting diode"). 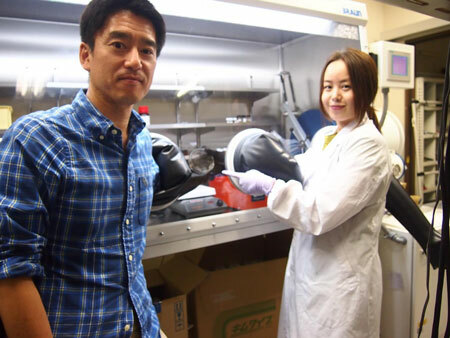 Professor Ken-ichi Saitow, Natural Science Center for Basic Research and Development, Hiroshima University and Graduate student Yunzi Xin, Graduate School of Science, Hiroshima University, have fabricated an Si QD hybrid LED. A hybrid LED is expected to be a next-generation illumination device for producing flexible lighting and display, and this is achieved for the Si QD-based white-blue LED. The Si QD hybrid LED was developed using a simple method; almost all processes were solution-based and conducted at ambient temperature and pressure. Conductive polymer solutions and a colloidal Si QD solution were deposited on the glass substrate. The current and optical power densities of the LED are, respectively, 280 and 350 times greater than those reported previously for such a device at the same voltage (6 V). In addition, the active area of the LED is 4 mm2, which is 40 times larger than that of a typical commercial LED; the thickness of the LED is 0.5 mm. Professor Saitow stated, "QD LED has attracted significant attention as a next-generation LED. Although several breakthroughs will be required for achieving implementation, a QD-based hybrid LED allows us to give so fruitful feature that we cannot imagine." Regarding quantum dots: Semiconductor QDs can produce full-color luminescence through tuning of the particle size. QDs have attracted significant attention as potential components of next-generation solid-state light sources, including LEDs.